Online Relay out VERITAS allows you to change the layout of a VERITAS Volume while it is live and mounted. Change a RAID0 to a RAID5 without a second of downtime! Snapshot Take a snapshot of your data, creating a "shadow" of it which you can use for online backups. Hot Relocation Designate "spares" which will take the place of failed disks on the-fly. Dirty Region Logging (DRL) Volume transaction logs which provide fast recoveries after system crashes. Before going for installation of VxVM we need to understand the VxVM objects and its components. Basically VxVM uses two types of objects which can handle storage management. s# - Represent as Slice or Partition. The connection between physical objects and VxVM objects is made when you place a physical disk under VxVM control. Let we see brief about the Virtual Object one by one. 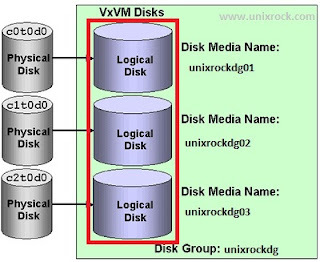 Each VM disk corresponds to at least one physical disk or disk partition. A VM disk typically includes public region (allocated storage) and private region where VxVM internal configuration information is stored. 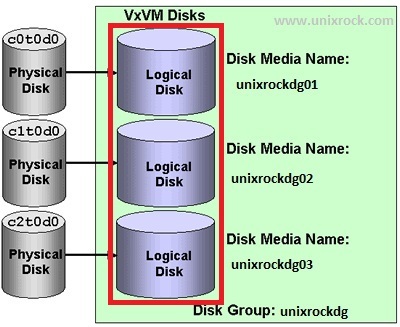 Each VxVM Disk has a unique virtual disk name called a disk media name. The disk media name is a logically used by Volume Manager for administrative purposes. 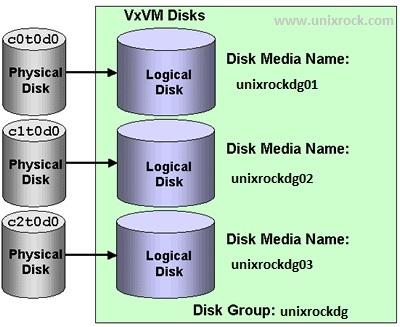 A VxVM disk is given a disk media name when it is added to a disk group. You can apply the disk media name or allow Volume Manager to assign a default name. Once a VxVM disk is assigned a disk media name, the disk is no longer referred to by its physical address of c#t#d#. 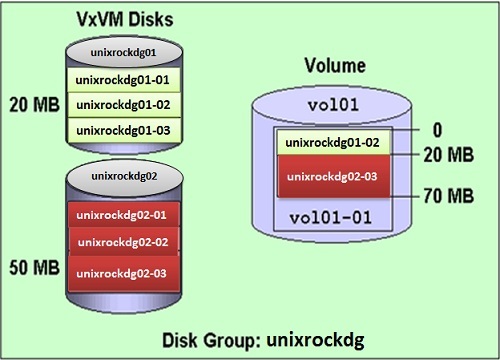 3 disks brought into Volume Manager Control and assigned the Disk Media Name (VM Disk) and grouped into disk group by name "unixrockdg"
A disk group is a collection of VM disks that will share a common configuration. 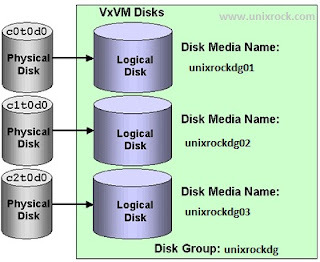 A disk group configuration is a set of records with detailed information about related VxVM Objects, Attributes, and Connections. The default disk group is rootdg (or root disk group). A disk group name can be up to 31 characters long. A subdisk is a set of contiguous disk blocks. 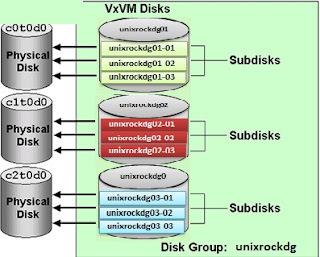 A VxVM disk can be divided into one or more subdisks. 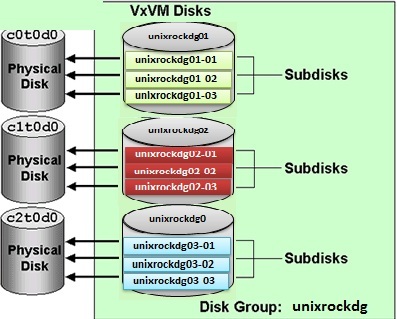 A subdisk is a set of contiguous disk blocks that represent a specific portion of a VxVM disk. Any VM disk space that is not part of a subdisk is consider as free space. We can use free space to create new subdisks. VxVM uses subdisks to build virtual objects called plexes. 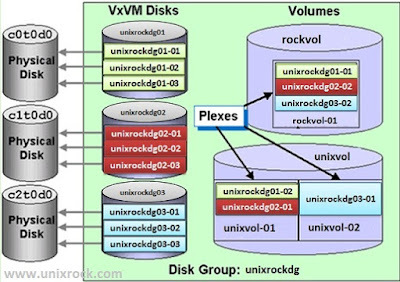 VxVM uses subdisks to create virtual objects called plexes. The default naming convention for plexes in a volume is volumename-##. The default plex name consists of the volume name. A volume consists of one or more plexes, each holding a copy of the selected data in the volume. Due to its virtual nature, a volume is not restricted to a particular disk or a specific area of a disk. The configuration of a volume can be changed by using VxVM user interfaces. Configuration changes can be accomplished without causing disruption to applications or file systems that are using the volume. For example, a volume can be mirrored on separate disks. Its name can contain up to 31 characters. It can consist of up to 32 plexes, each of which contains one or more subdisks. It must have at least one associated plex that has a complete copy of the data in the volume with at least one associated subdisk. All subdisks within a volume must belong to the same disk group.